“The personal letter to the Campaign for Clean Air in London from Dr Krzyzanowski, who is Europe’s leading scientific authority on air quality and health, is a very welcome and significant contribution that should be of considerable interest to everyone in Europe who is genuinely committed to improving air quality” said Simon Birkett, Principal Contact for the Campaign for Clean Air in London. “For far too long, air pollution policy has failed to tackle air quality holistically (or fast enough). For example, some of the measures introduced to reduce particulate matter (PM2.5 and PM10) emissions from diesel engines (which have still not resulted in European Union (EU) legal limits for 2005 being met) have exacerbated the nitrogen dioxide (NO2) air pollution problem to the extent that Transport for London estimates that 1,370,000 people in London in 2008 will be exposed to unhealthy levels of nitrogen dioxide unless urgent further action is taken. “By confirming the importance of individual air pollutants and the need to adopt a comprehensive approach to address particulate matter, nitrogen dioxide and ozone if the health impacts of the pollution are to be eliminated, Dr Krzyzanowski has again made a major contribution to the understanding of crucial air quality issues. There is no longer any excuse for political leaders and other policy setters to fail to tackle air pollution urgently and holistically. SEE BELOW THE FULL TEXT OF A PERSONAL LETTER TO THE CAMPAIGN FOR CLEAN AIR IN LONDON FROM DR KRZYZANOWSKI WHO IS THE WORLD HEALTH ORGANISATION’S SENIOR ADVISER IN EUROPE ON AIR QUALITY AND HEALTH. DR KRZYZANOWSKI WAS SCIENTIFIC SECRETARY TO THE PROJECT THAT PUBLISHED THE “WHO AIR QUALITY GUIDELINES GLOBAL UPDATE 2005”. Thank you for your letter and information about the ambitious Campaign for Clean Air in London. The WHO Air Quality Guidelines address, traditionally, individual chemical compounds, such as ozone, or indicators of pollution mix, such as PM10 or PM2.5 . The guidelines aim at the assessment of health hazards specific to each of these pollutants independently, and recommend that the air people breathe contains EACH of the pollutants in concentrations lower that the guideline level. This also means that achievement of the guideline level for one pollutant should NOT be done with an increase of other pollutant concentration above its guideline level. The importance WHO puts on PM10 and PM2.5 reduction is related to the magnitude of the health impacts of the presently observed levels of this pollution on health, expressed by hundreds of thousands of premature deaths attributed to anthropogenic PM in Europe annually. There is no doubt that these risks must be reduced. This can be done only by reduction of population exposure to PM2.5 . Though the observed effects include, as for PM, increased mortality, the estimates of health impacts of ozone exposure in Europe are markedly lower than those for PM. For NO2, the lack of quantitative effect estimates independent from the PM2.5 or PM10 makes the estimation of the impact of NO2 impossible. This may result in an interpretation of the “lower importance” of these pollutants. WHO does not make such distinction, as it may be considered to be a “managerial decision”, being outside of the scope of the WHO Guidelines mandate. As the Commentary section of the NO2 chapter explains (page 376/7 of the full text of the AQG Global Update 2005), besides of the independent effects of NO2, the guideline for long term NO2 average intends to protect people from adverse effects of complex mixtures of combustion-related pollution. We hope, therefore, that the action to clean the air in London, and in all Europe, will address all hazardous air pollutants, including particulate matter as well as nitrogen oxides and ozone. Only such comprehensive approach may result in elimination of the health impacts of the pollution. I was pleased to meet you earlier in the year at the excellent London Air Quality Network (LAQN) seminar on 19 January when I was representing a community group called The Knightsbridge Association (as Chair of its Transport and Environment Committee). Since meeting you, we have established with others the Campaign for Clean Air in London which has only one aim which is to achieve urgently at least World Health Organisation (WHO) recommended standards of air quality throughout London. I hope that you will approve of our aim! The Campaign has received support from the Mayor of London, leading politicians from all four political parties in London as well as leading business and community groups including the Central London Partnership, London First and The Knightsbridge Business Group. We have recently received a pledge of support from the National Society for Clean Air and the Environment. Our campaign website is shown in the letterhead above. As you know, London has very serious air pollution problems. The Mayor of London has estimated that, for example, some 1,031 people died prematurely in London in 2005 due to particulate matter (PM10) exposure which is more than four times the number that died from road traffic accidents. 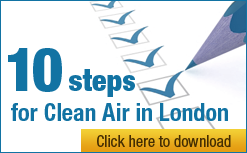 In a consultation document published at the end of last year, in connection with the proposed Low Emission Zone, Transport for London (TfL) noted that 1,370,000 people in London would be exposed to an annual mean level of nitrogen dioxide (NO2) of over 40 μg/m3 in 2008 unless action is taken to improve air quality. With such air quality problems in London, much work is underway to revise air quality strategies for the city as a whole and at individual borough level. I have been fortunate to be invited to attend several meetings recently in connection with this process. However, I have been most concerned to hear people comment (on several occasions) that the WHO’s Air Quality Guideline (AQG) values for nitrogen dioxide and ozone (O3) are not as important as those for particulate matter. It would be possible to go along with dismissals of the relative importance of NO2 and O3 problems (and by implication their absolute importance), except that these standards are at the heart of strategically important matters. An example being that TfL has said that, even though vehicles with Euro IV engines are now available, there is no planned date for the key Euro IV emission standards for NOx to be required for large vehicles for free entry to the proposed Low Emission Zone simply because abatement technology and testing standards for older vehicles have not yet been approved. Major air quality benefits could be delayed for many years simply because not enough priority is being given to approve abatement technology and testing standards for NO2 for older vehicles (unless a requirement for Euro IV engines per se is introduced – as we are requesting). I could provide other examples of this lack of focus on NO2 which is alarming to those of us wanting better air quality in London. provide us with guidance on their relative importance in a quantifiable way that would aid in their prioritisation? My understanding is that PM10 may have achieved an unduly high profile in people’s minds because of the volume of early research that was undertaken in the United States rather than just because it is a serious problem on its own (which of course it is). We have not found any guidance on the relative importance of the AQG values in either the report mentioned above or the earlier “Health aspects of Air Pollution: Results from the WHO project “Systematic review of health aspects of air pollution in Europe)””. For that reason, we are writing to seek your advice to inform the key strategic thinking and prioritisation that is currently underway in London.